Home » Europe » Hello from Athens, Greece! My first few days in Athens, Greece have been truly amazing. Maybe it is from the pure exhaustion of jet-lag (an eight hour time difference) or maybe it is the excitement of exploring a new country. The first two days consisted of sight-seeing. 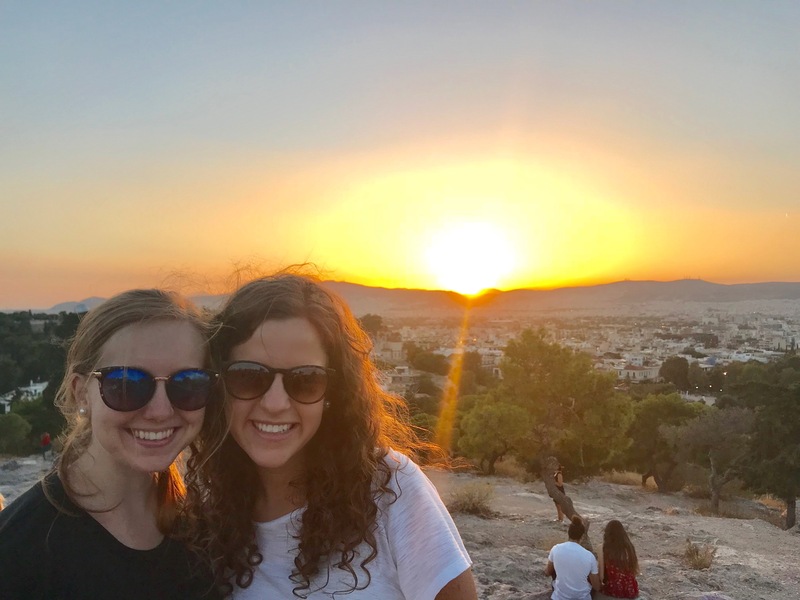 Our team began the trip with a scavenger hunt that allowed us to explore all over the city, eat authentic Greek food for the first time, interact with some of the locals, and exchange our currency. I was able to explore Mars Hill (where Paul preached in Acts 17), the Temple of Athena, Parliament, and several famous squares around Greece. At the end of the week, I will travel to Hydra – a beautiful island that is basically a live version of Mamma Mia! On Sunday, I was able to participate in a traditional Greek Church service. Their service is very similar to my church service in America and I loved being a part of this worship experience. I was able to interact with some of the local Greek people and it was truly humbling to have them welcome us like their own as we worshiped the same God, just in different languages. I have encountered many locals. Many are very friendly and welcoming, but some are skeptical of why a group of forty Americans are overwhelming their city. The language barrier is hard when communicating with the Greek people, but a smile is universal language everyone understands. Most of the locals work in the city at different restaurants and shops; however, I saw many hanging out with each other at the neighborhood coffee shops when we were walking around and advertising our upcoming medical clinics. The Greek people are just like you and me – they just speak a different language! As I write this post, it is Tuesday night. Our team has already completed two days of medical clinics and will continue to do medical clinics for the next two days. The language barrier is difficult and there are only a few translators for our entire team. This situation has resulted in me pointing to different body parts to understand what is hurting and speaking extremely slowly… and sometimes all I get in return is a blank stare. I have seen and heard gut-wrenching stories that these refugees have share with me and I yearn to do everything I can to help them heal. What is Athens, Greece using my five senses? I see beautiful landscape, ancient architecture, and lots of Greek people hurrying by. I hear several different languages – Greek, Arabic, Pharisee. I taste amazing Greek food. Truly, it is INCREDIBLE… Taziki’s does not even stand a chance! I occasionally I pass a restaurant that enlightens my smell, but otherwise the air is kind of pungent. I touch people who are in desperate need of physical and spiritual healing and those who just want a hug to know they are loved. I have collected several local Greek items for myself and my family that I will be returning home with. My favorite item I am bringing back with me is a brightly colored bowl that is hand-painted by a local Greek woman. This small token of Greece will be a daily reminder of the impact this week has had on my life. I will begin my journey back home to Alabama in a few days and right now I have conflicting feelings. I have fallen in love with the refugees I have cared for the past couple of days and will be so sad to leave, but I also desire to see my family and friends. But there is no need to worry about that right now – I am expectant for what the upcoming days entail. Bye or as the Greek people would say, αντίο!